Every 6 months a new sequence of 6 pages is featured. Next to the codex display case is a computer information point which deals with the themes of the chapters, and each of the individual pages in detail. The text for both this and the display was written by Professor Gordon Brotherston. 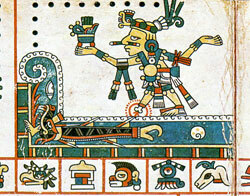 The codex case is linked visually and thematically with a large neighbouring case dedicated to Mesoamerica (Pic 2). 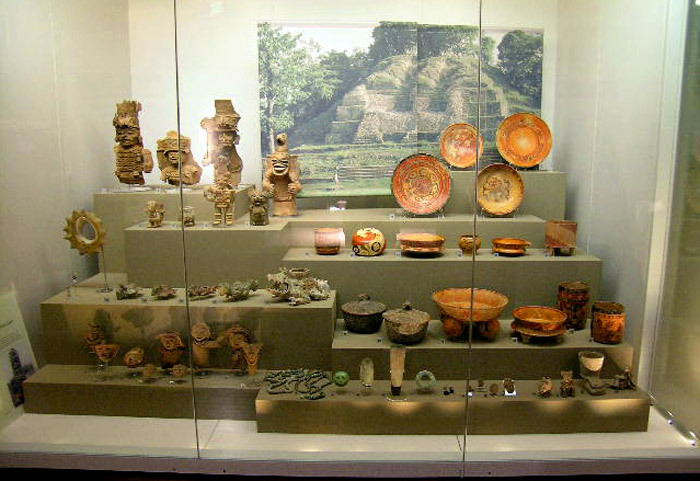 The case features predominantly Post-Classic Maya ceramics (although some wonderful Classic period jade items are on display as well - see pic 4) excavated by Dr. Thomas Gann (1867-1938), an amateur archaeologist working in Belize between 1894-1923. The case themes, such as trade (both pre- and post-conquest), for example, link with the major themes spanning the other sections of the World Cultures gallery (Africa, Asia, Oceania) - trade having a strong resonance in a port city like Liverpool. 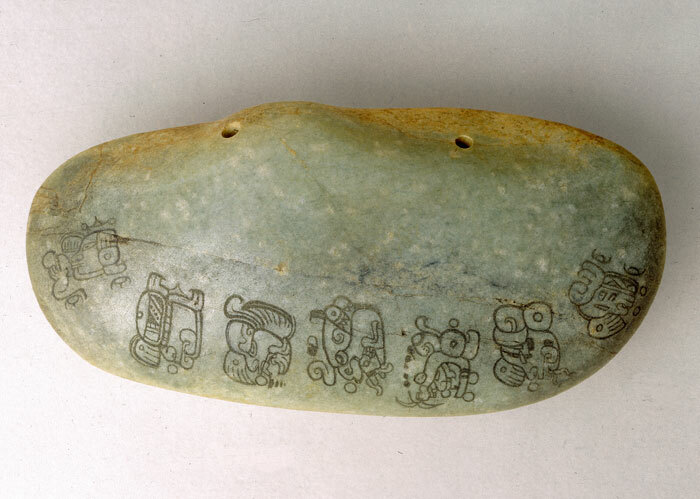 Of the 280 artefacts displayed in the Americas section of the gallery, 65 are Mesoamerican. In the webpages of the museum (links below) you can see a few images from the Codex - and you can download the famous Page One image as wallpaper for your computer - but it’s a pity there’s no explanation for the images shown. There’s some very brief background to the annals and ‘dream books’ (as the codices have been called), to trade before the arrival of the Spanish, and to Mesoamerica in general, and there’s a nice Aztec song-poem on the Americas introductory page. 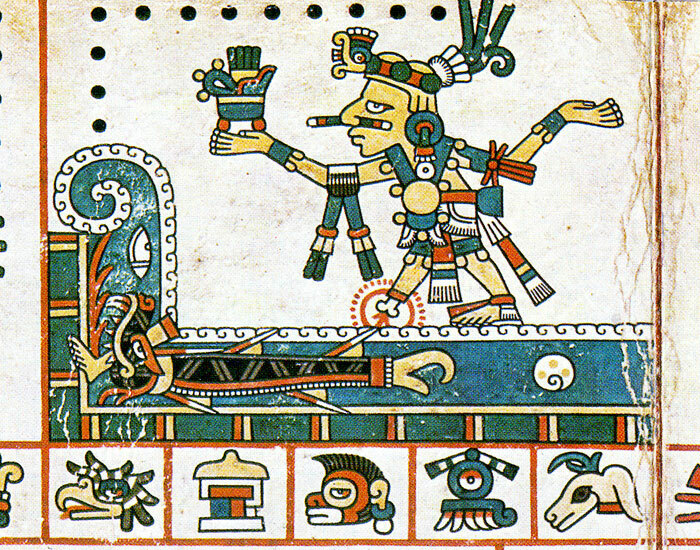 The page we illustrate here (Pic 3) from the Codex (not shown on the Museum’s website) shows how Tezcatlipoca tempted Cipactli the Earth Monster to the surface of the great waters by using his foot as bait. In swallowing his foot (enlarge pic 3) (s)he lost her lower jaw. Hideously crippled (s)he was unable to sink and thus the earth was created from her body. With thanks to Joanna Ostapkowicz, Curator, American Collections, National Museums Liverpool, for help in compiling the information for this page. NOTE: See the update at top of this page. The resources mentioned in this feature - especially those on the Museum website - are now ‘temporarily’ unavailable.